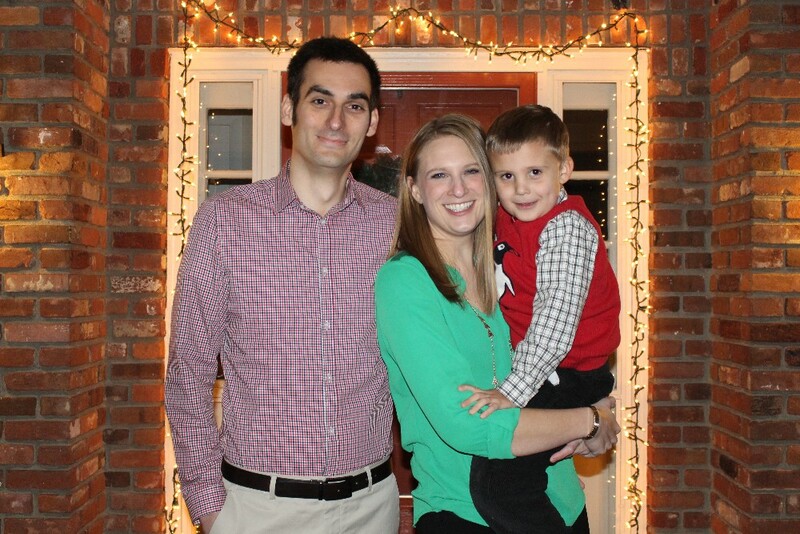 By now, most of the readers of this family blog have seen our annual Christmas card. And if you haven’t, you likely know the stories behind the “game pieces.” The idea for the design was inspired by Wesley’s increased interest and play-ability of board games. His favorites are Candy Land and Shoots & Ladders. 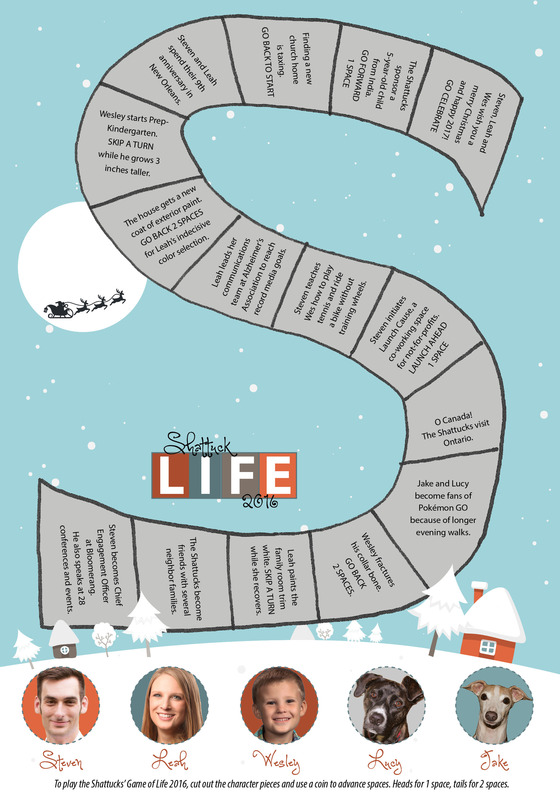 He has yet to actually play LIFE, but I found it fitting for this year’s card to share a few updates within the last year. Steven becomes Chief Engagement Officer at Bloomerang. He also speaks at 28 conferences and events. In January, Steven took over management of sales and leads in addition to his marketing team. He’s a natural leader and has done a fantastic job in this guidance role. He’s requested at many NPO and donor/development conferences, and he’s quite the presenter on donor retention and engagement. If it’s possible, he’ll pick one or two locations and buy a plane ticket for me to join along, and we’ll make a long weekend out of it. He’s pretty great! The Shattucks become friends with several neighbor families. The best thing about living in this “new” neighborhood is the amount of young families. We purposefully played in the front yard during the warm months to meet and scout out families with kids about Wes’ age. It worked! I can’t tell you how much I love and appreciate having friends and built-in entertainment just a few doors away. Leah paints the family room trim white. SKIP A TURN while she recovers. Whew, that project took forever. It does look so good, though. I still need to touch up the ceiling where I got a little paint happy… Since THAT project, we’ve painted the guest room (December), installed glass block windows in the basement (October), and plan to install new interior doors upstairs (January?). Wesley fractures his collar bone. GO BACK 2 SPACES. Jake and Lucy become fans of Pokemon Go because of longer evening walks. The mobile app game fad sorta faded, but we saw a lot more of the neighborhood and surrounding parks while it lasted. Wesley still thinks it’s great that he’s in on the “joke” and can’t say walk aloud for fear of too-excited dogs. He now calls it a W-A-L-K in normal conversation. O Canada! The Shattucks visit Ontario. What a great trip. Easily one of the best yet. Steven initiates Launch Cause, a co-working space for not-for-profits. LAUNCH AHEAD 1 SPACE. If you know nothing about Launch Cause, stop what you’re doing and check it out. I’m super proud of what he started back in February. Steven teaches Wes how to play tennis and ride a bike without training wheels. Summer 2016 was all kinds of fun. I feel like Wes is at an exciting age. Not that baby and toddler years weren’t exciting in some capacity, but we’re doing so much together. It’s fun to pretend together, explore together and learn together. Wes enjoys tennis enough that he’s requested to play outside in 30-degree temps with Steven. This prompted a search for indoor tennis lessons, which start next weekend! Leah leads her communications team at Alzheimer’s Association to reach record media goals. We kicked some major rear end. Over the years I’ve become better at acknowledging and taking credit for achievements, and while yes, it was a team effort to reach, I recognize that it was by my guidance and direction that we reached 120% of our media impression goal. I’m proud of what we’ve done and the bond between my coworkers. The house gets a new coat of exterior paint. GO BACK 2 SPACES for Leah’s indecisive color selection. Overall, I like what we ended up with. I’m still not settled on the color of the shutters, and eventually we’ll replace them entirely. Since the exterior paint job, we’ve replaced the garage doors, and they help clean up the look even more. Wesley starts Prep-Kindergarten. SKIP A TURN while he grows 3 inches taller. While he’s not the tallest kid in his class, he’s certainly not far behind. THREE INCHES in one year! I’ve had several trips down memory lane because Wes is attending the school that my sister and I did. My third grade teacher is the principal, and my fourth grade teacher is the assistant principal. The school nurse is still there, as well as a handful of elementary, middle and even high school teachers! Several fellow alumni have sent their children to the school, and it’s been fun to reconnect with former classmates from various graduating years. Steven and Leah spend their 9th anniversary in New Orleans. The trip surrounded a speaking engagement in Baton Rouge. We were nervous to go because it was just weeks after the shooting of Alton Sterling and days after massive flooding. But it was safe to travel, and we had the best time. I love that we’re able to be together and see unique places – just the two of us. You should see the excel document we started – a pros and cons list of sorts. I guess we were a little picky in what we wanted for our family, but after visiting multiple churches in 9 months, we determined that it might be us tasked to start the changes we desire in a church home. We were ready to settle where we could serve, and we’ve been attending a church regularly for a handful of months now. I decided to join their Christmas choir, which was another way to meet and connect with people, and it was a terrific idea. It felt so good and fulfilling to serve by song with others. Last month we received our first letter and sent a lengthy response with photos of our family. Wesley frequently asks questions about Jastin and life in India, and it’s opened up honest conversations about faith, materialism and community service. It’s fascinating to watch him understand his role in our family and in society. We hope to be able to support additional families in other ways in 2017. Thanks for being a part of our lives. We’re the better for it. What is it with fall? It’s been the roughest season for our family each year, and this one has been no different. An increase of fundraising events, conferences, school projects are the old bystanders, but even when I look around us, nearly everyone is strained. Grief. We said goodbye to Pa Shattuck in late October. He lived by himself in the Syracuse, New York, area, and though the distance limited our socialization, he was dedicated to his grandkids and great-grandchildren. He attended every wedding and graduation and remembered every anniversary and birthday. He was a decorated veteran who served in Normandy at age 19. He was active in his parish and in the community. His death came unexpectedly, and it affected us more than we anticipated. The anniversary of a friend’s death passed in September. And social media has opened up my heart to several families facing unfathomable loss of family members to tragic sickness and accidents. Some days it’s hard to breathe for how much I ache and mourn with people. At times, I’m afraid of referencing myself publicly as a Christian for fear of mockery. Sometimes I’m afraid to stand up for my faith, and I’m afraid to disagree with other Christians. I’m afraid I’ll say the wrong thing at the wrong time, and I’m fearful that I’m making a mistake for feeling this way. We don’t want to be hypocrites. We don’t want to be lazy or naive. Our family wants to DO SOMETHING to love our neighbors and take care of the earth God created in addition to prayer. I fear the Lord, and I pray that he shines through the dirt and grime and mess. Anger. Usually this follows fear. I’ve found myself lashing out at coworkers, Wesley and Steven. I try to keep a calm demeanor, but when I’ve been racked with grief and fear, it has been difficult. I’ve hung Psalm 19:14 near my computer so that I can be reminded to keep my words and thoughts positive and pure. Exhaustion. My negative stress level has caused an increased number of migraines and near-fainting spells in the last few months. Do you remember my weird, complicated migraine when I was pregnant with Wesley? Those symptoms have returned on occasion – once while driving. I’m thankful that each time they’ve returned, I’ve been surrounded by understanding, caring people. My friends who have lost loved ones to death, divorce or sickness; my coworkers who are fearful and upset by internal conflicts and national conflicts; those who are frustrated with the church, which can have some things backwards, hypocritical or off-focus; my son and his generation who are concerned about “bad people” leading this country; and their parents, who are trying to process and have open and honest conversations about respect — the only thing in which we have control is our response. In words, actions and thoughts, may it be a respectful, mindful and truthful response. 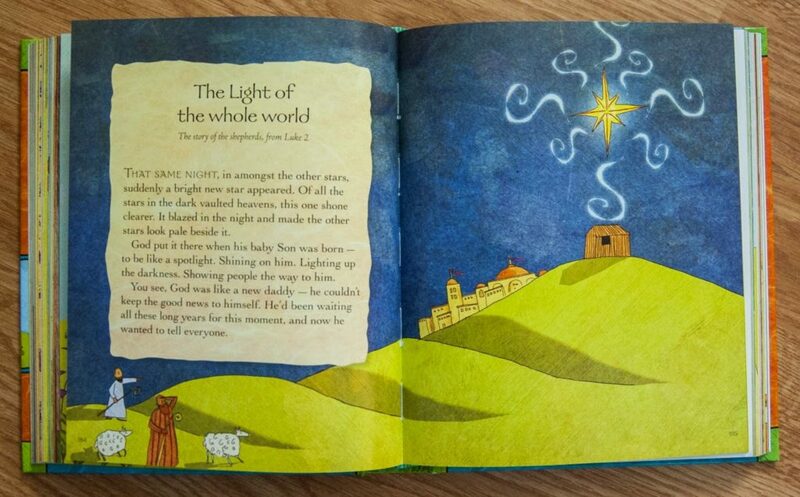 Wes and I are reading through the Jesus Storybook Bible for advent, and it might be speaking more to my heart than his. We’re starting at the beginning and seeing how Jesus’ arrival was anticipated throughout Old Testament people’s bad decisions and poor choices. The labor pains started at the fall of Adam and Eve and perhaps it’s just getting more pronounced today.